The following altar we find (proceeding towards the main door) is dedicated to St. Lucia. The hands of his statue hold a tray. On it there are two polychrome marbles, representing the eyes that were torn during martyrdom. Translation: Light up our eyes so that they do not fall asleep in death. The statue of St. Lucia is the work of Billia Antonio (1813 - 1891). Sculpted, painted and gilded wood (cm 164x73x50). 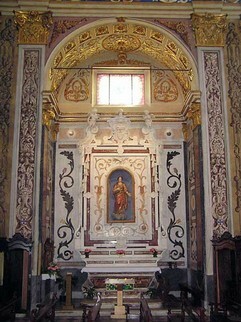 2006 restoration by Anna Graffione (Finale Ligure).